A second unaired episode of Persona 5 the Animation will be bundled with the 12th Blu-ray and DVD volume to be released on June 26. 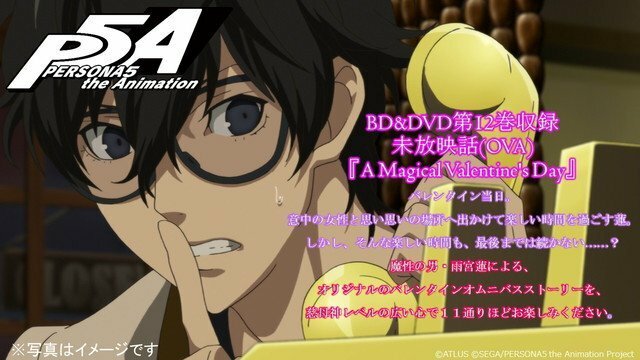 Titled "A Magical Valentine's Day," the episode will depict Ren Amamiya going to various places on a date-like experience. The first unaired episode, "Proof of Justice," was previously announced to be bundled with the 11th Blu-ray and DVD volume on May 29. The 26-episode TV anime by studio CloverWorks aired in spring last year. Two special episodes then aired on TV following the series: "Dark Sun..." on New Year's Eve and "Stars and Ours" on March 23. "Dark Sun..." will be bundled with "Proof of Justice" in the 11th anime volume; "Stars and Ours" will be included in the 12th volume, along with "A Magical Valentine's Day" and audio commentaries by the main cast members.